Pray while walking to the bus stop. Ask her if anything special happened during the day. Remind her that we’re proud of her. Check to see if she has homework. Have her read a little. Have “spending time” when we can just cuddle & talk with her. So far, she LOVES school. Despite her sometimes fatigued body in the morning and objections to eat efficiently, she doesn’t complain about going to school. 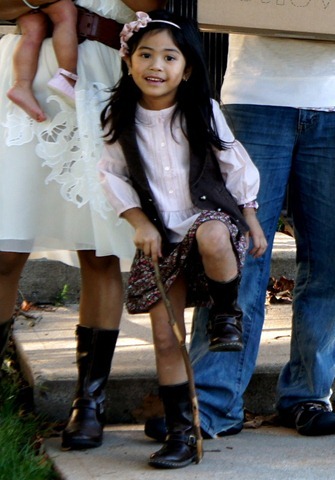 She looks forward for it, sincerely, because she’s made friends and she enjoys the new activities each day. She also likes her teacher, from what I gather, is fair to all the kids, encouraging and patient. Here are two of her recent drawings. She’s getting better with spacial proportions. The one on the left is a drawing of her room, including her windows, dresser, tv, carpet, picture, door, and building blocks (& building), and of course, herself, holding a block. 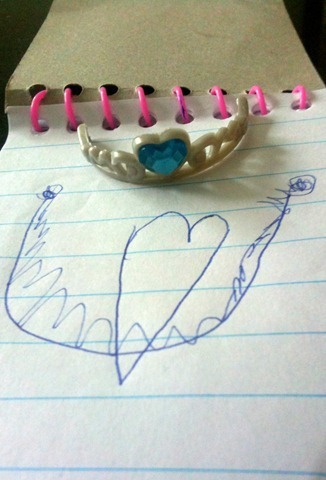 And the right side is a drawing of one of her doll’s princess tiaras. She’s also reading faster now, although still having to sound out words rather that sight reading. But definitely better with it. I would say by the end of this year, she’ll be even better!